These two similar rules are graduated on just one side. 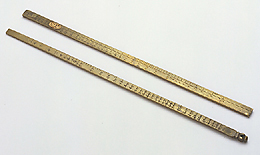 Although they give no indication of their purpose, they are almost certainly gunner's gauge scales, used to give the weight of a spherical shot from a measure of its diameter. Fragments of wooden instruments of this type have been found in the remains of wrecks of the Spanish Armada. Brass examples have also been recovered by nautical archaeologists.